Did Fr. Lombardi Contradict Cardinal Sarah? HE PRESS OFFICE OF THE VATICAN on 11 July 2016 released a statement which was probably the final message by Fr. Federico Lombardi before he retired. Many who are angry about Cardinal Sarah’s public statements are (predictably) acting as though Fr. Lombardi has rebuked Cardinal Sarah. I find such assertions absurd. The English translation of Fr. Lombardi—not the French—contains grammatical issues which preclude the notion that the current books favor “versus populum” celebration. I must admit that I put very little stock in the words of the Vatican Press Office. I have seen many instances over the past years where their “clarifications” only confuse matters. For example, Fr. Lombardi never condemns the REFORM OF THE REFORM, he says the “phrase” can sometimes confuse. Properly understood (according to what Fr. Lombardi wrote) it would not be problematic. Yet people are coming away with the opposite impression! Throughout the papacy of Pope Francis, I’ve noticed a surprising lack of understanding of how the media works. The results from that lack of understanding have often been unfortunate. As far as I know—and perhaps a priest can correct me if I’m wrong—priests who celebrate the Ordinary Form are bound by the actual rubrics in those books. 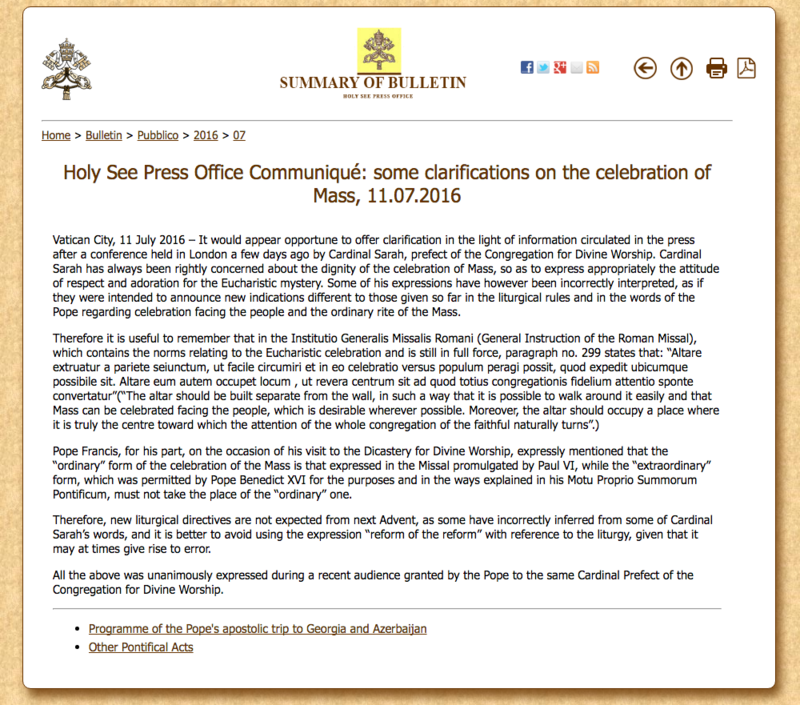 They are not allowed to make liturgical changes based on a press conference by Fr. Lombardi. The Congregation for Divine Worship remains in charge of interpreting the liturgical laws which they write (and then submit for approval by the pope). Cardinal Sarah is Prefect of the CDW. As we have repeated over and over on our blog, no significant changes have been made to the rubrics of the Ordinary Form since it was promulgated in 1970. Period. I know this sounds hard to believe and “boring” but it’s true. Finally, to those who have claimed that Cardinal Sarah, Prefect of the CDW, “lied” about what Pope Francis told him, I encourage those people to send me an email. I have a bridge I’d like to sell them.